May 14, 2013 Sheikh Yusuf Qaradawi, president of the International Union of Muslim Scholars, visited Gaza on May 7-10 at head of an entourage of 45, including senior officials of the organization. In the past, Qaradawi was a candidate for leadership of the Muslim Brotherhood, and over the years he has acquired the status of spiritual leader of this movement and of its Palestinian branch, Hamas. Qaradawi received a warm welcome, especially from the Hamas leadership. They saw the visit as an important affirmation, by the longstanding and supreme religious authority of the Sunni Muslim world, of Hamas’ rule in Gaza. The visit affirmed Hamas as a faithful exponent of the Palestinian people and the jihadist enterprise, aimed at conquering the State of Israel and making it part of the Islamic state of Palestine – eventually to be one of the provinces of the Islamic caliphate whose capital will be Jerusalem. Qaradawi’s visit was extensively covered in the Hamas government’s media, which again highlighted the ‘sheikh of jihad’s’ (as Hamas Prime Minister Ismail Haniyeh called him) backing for this Palestinian movement. Upon his arrival, he was greeted by the Hamas Prime Minister and called immediately for “Jihad to death” against Israel. 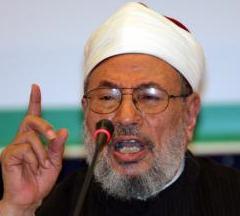 Qaradawi was accompanied by the notorious anti-Semite and close colleague Salah Sultan. Qaradawi made comments in which he denied Israel’s right to exist and waxed enthusiastically about Hamas rocket fire into Israel. We also reported that during Qaradawi’s visit, the Egyptian Muslim Brotherhood held its first ever anti-Israel rally since coming to power, surely no coincidence and likely an attempt to avoid being upstaged by Qaradawi.